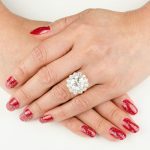 The experts at Estate Diamond Jewelry have prepared many of the common questions that are asked about vintage engagement rings and provided quick and easy to understand answers. Feel free to keep coming back to this page. We will keep on adding more common vintage engagement ring questions on a regular basis. What hand do you wear the engagement ring on? In the United States, the most common practice is to place the engagement ring on the fourth finger of the left hand. There are some couples who only choose to move the ring to the left hand after the wedding, but the vast majority of engaged girls will place the ring on the left hand from the onset. Countries with Greek Orthodox origins will place the engagement ring and wedding band on the right hand. The picture to the left shows the correct finger and hand placement. Technically speaking an antique engagement ring is a ring that is older than 100 years. Most rings that are older than 80 years are still usually referred to as “antique”. All antique rings are considered vintage, but are not necessarily considered estate. A vintage ring is a ring that is older than 20 years. If a ring was made in 1890 for example, it can be labeled as both vintage and antique. An estate ring is a ring that was previously owned. In most cases estate ring is also vintage or antique, but it doesn’t have to be that way. Can a vintage engagement ring be resized? Most vintage engagement rings can be resized by an expert jeweler without compromising the integrity of the ring. Engagement rings that have diamonds, engravings or openwork along the bottom of the shank should not be resized due to the risk of damaging the ring. 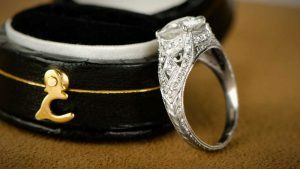 In most cases an expert jeweler who specializes in antique jewelry should be consulted before requesting a ring sizing. To learn more about ring size, click here. How delicate our vintage engagement rings? Vintage engagement rings may sometimes be a little more delicate than modern engagement rings, but not always. Any vintage ring that was created with a high level of craftsmanship should still be great shape 100 years later. Quality rings can last far longer than 100 years. It is still important however, to have a qualified jeweler take a look at the ring every few years in order to ensure that all the stones are secure. Cut a very thin piece of paper. Wrap the paper around your ring-finger three times. The paper should be placed near the knuckle of your ring finger. Cut or mark the remaining paper that extends past the three complete loops. Measure the length of the paper size and divide it by 3. Calculate your size based on the finger chart. Here is the link to calculate the finger size. Wrapping the paper around 3 times helps bring the margin of error lower.